Once on-board, our technician will do a comprehensive evaluation of your electrical system and provide you with an estimate of the work that needs to be performed. Once you’ve approved the estimate, our technician will complete the job quickly and professionally. We specialize in marine electrical installation and repairs. 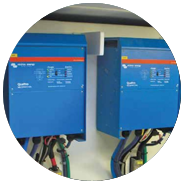 We are also a distributor of numerous brands of marine electric systems, and offer competitive pricing on starters, alternators, and batteries.